We get a lot of questions in our e-mail about Lumineers. Let me tell you what I think about them. Lumineers are a brand of porcelain veneers that are made by DenMat, a dental materials company in Santa Maria, California. When they were introduced, their selling point was that they were stronger than most other brands of veneers, so they could be made thinner. Traditionally, it has been generally recommended that porcelain veneers be made a minimum of 0.5 millimeter thick, about the thickness of a fingernail. For Lumineers, they can go a little thinner, down to 0.3 millimeter. However, in the past few years, other brands of ultra-strong, ultra-thin porcelain have been introduced, completely eliminating this advantage and making the disadvantages of Lumineers more important. From what I have seen, these other brands are much more esthetic. If a dentist uses the Lumineers brand, because of trademark restrictions of the DenMat company, they have to be made in the Lumineers laboratory in California. Not only is this laboratory large and impersonal, but many expert cosmetic dentists feel that their work isn’t of the highest esthetic quality. The two major complaints are that they make patients’ teeth look bulky, and that the teeth are chalky and opaque. Other laboratories with other brands seem to give much nicer results that don’t look bulky or chalky. DURAthin is one of these other high-strength brands that can be made ultra-thin. Check the DURAthin page to see some photos and compare them with the Lumineers photos posted further down this page. The difference is that with DURAthin the cosmetic dentist can use his own ceramist with whom he likely has a personal relationship. The chalkiness and opacity may come from the Lumineers material itself. Yes, if there are tetracycline stains, the porcelain needs to be fairly opaque. But in those cases, to get a beautiful result, a cosmetic dentist would need a thicker veneer anyway and the tooth should be prepared. The inner layer could be more opaque and then the outer layer could add translucency. Thinness makes it feasible to place Lumineers and other ultra-thin brands with a “no-prep” technique. In other words, a dentist would not have to shave away any tooth structure in order to place them. So is that a good idea – to not prepare the teeth before placing porcelain veneers? 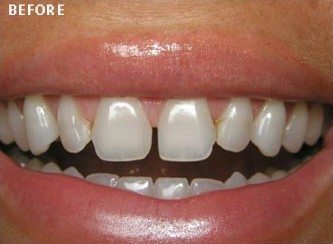 Placing extra-thin porcelain veneers without any tooth preparation actually makes the artistry of a new smile makeover more difficult. But the way Lumineers is promoted to dentists, they make it sound easier. Adding 0.3 millimeter to the thickness of the teeth can easily make them look bulky. They also have to be made about 2 millimeters longer. And they could end up with a rounded look, because they have to be feathered out on the sides. Now with great artistic skills, a dentist and a laboratory technician can work within these constraints and still produce a beautiful result, but it is harder, not easier. Lumineers, however, seem to attract dentists with less artistic inclination and skill, because that is the focus of DenMat’s marketing efforts. I haven’t yet seen a Lumineers case that I would judge as beautiful. I have seen no-prep cases where the results looked beautiful, but never with Lumineers. Again, that could be a combination of the lower quality esthetics produced by the Lumineers lab and the type of dentists who tend to do Lumineers cases. Yes, her teeth are whiter in the “after” picture. But is her smile really improved? Frankly, I like her “before” smile better. 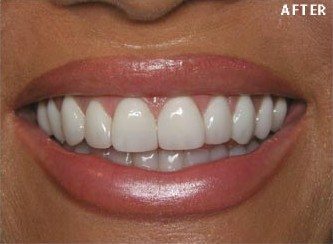 The whitening could have been achieved with simple bleaching for a superior result. 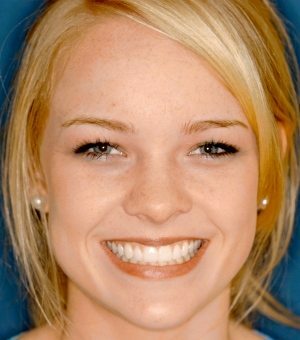 In her “after” smile, the teeth look a little too long, too bulky, and too rounded. To me, they make her face look a little fat. One patient wrote to me and complained that her lip was catching on her Lumineers. This can be a problem when the teeth are made a little thicker. Another problem with a no-preparation technique is that, unless the work is done very carefully, you will likely end up with a slight ridge at the edge of the veneer. This ridge could attract stains and plaque. Or, it could irritate the gums. Again, this can be managed with excellent cosmetic dentistry skills, but those skills aren’t generally possessed by Lumineers dentists. One selling point is that, since the teeth aren’t prepared beforehand, you could supposedly have the Lumineers removed if you decided you didn’t like them. I understand the appeal of that reasoning. But I think the best insurance isn’t whether or not you could have them removed afterwards, but choosing the right cosmetic dentist to place them in the first place. In twenty years of doing porcelain veneers, I never had a patient come back regretting their new smile or asking about having them removed. But I have received many e-mails from patients who have been unhappy with their smile makeovers done by general dentists and who would do whatever they could to get their original smile back. Furthermore, it would be very difficult to remove the Lumineers without damaging the teeth. They don’t just pop off–they have to be ground off. And doing that without gouging or nicking the enamel, that’s a tough order for a dentist. So I believe that this idea that the procedure is reversible is just a psychological selling point, not an actual benefit that is going to happen in the real world. I honestly can’t see any reason for getting the Lumineers brand, when there are other, more esthetic brands available. If you want to avoid tooth preparation, there are ways to do that with an excellent cosmetic dentist. Because of the quality of the dentistry, Lumineers in your market may be available for less money than other brands. But do you know what’s even cheaper? Doing nothing. My advice would be to not do anything until you can afford to have it done right. The manufacturer, DenMat, is promoting their brand as easy to place, and they offer a two-day course after which the dentist is certified to place Lumineers and they get to be on DenMat’s referral list. But two days is nowhere near enough time to turn a general dentist into a cosmetic dentist. Many cosmetic dentists feel that it takes three to five years, attending numerous continuing education classes and working to apply the principles learned, to become a good cosmetic dentist. And even then, the dentist needs to be artistically inclined to start with and passionate about esthetics. Using a no-preparation technique requires more, not less, artistic ability. To find an expert cosmetic dentist, go to our find a cosmetic dentist section. Here is a case done with Lumineers. While the results are good, the teeth look a little too rounded and too bulky. Click each photo to see a close-up of the smile. For comparison, below is a case done with another brand of ultra-thin veneers, done by an expert cosmetic dentist in our mynewsmile.com network, and the results are truly beautiful. 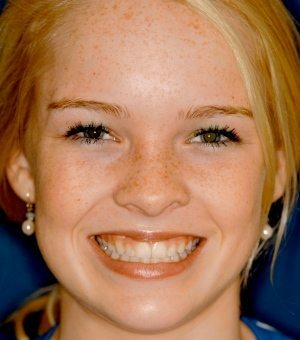 Alexandra came to Dr. J. Fred Arnold, of Lexington, Kentucky, immediately after getting her braces off. She was pleased that her teeth were straight, but felt they were too small and that she showed too much gum when smiling. She was getting ready to leave for college and hoped Dr. Arnold could improve her smile even more. 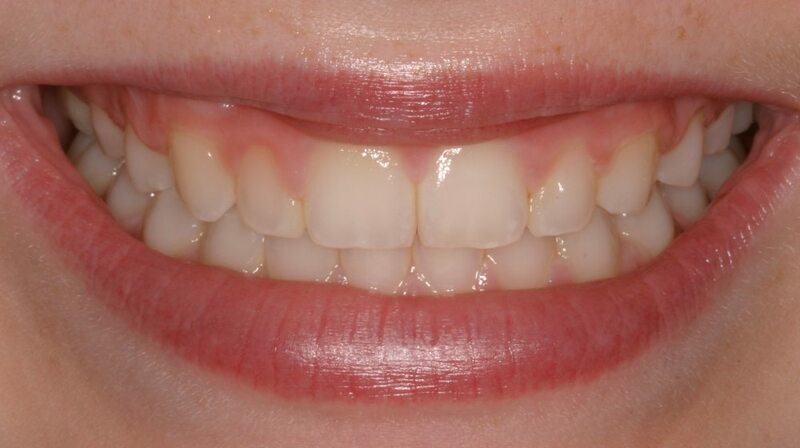 Dr. Arnold did 12 ultra-thin porcelain veneers with no tooth preparation, but did not use the Lumineers brand. Instead, he used his master ceramist, Mike Morris. He also performed a gum lift. Alexandra was thrilled with the final result. To read more about Dr. Arnold, click here. The before picture shows Alexandra’s gummy smile and small teeth. 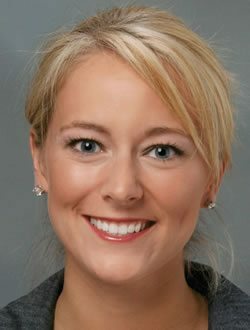 Dr. Arnold was able to place porcelain veneers without any grinding on the teeth beforehand. You can see the beautiful result. This case was not done with Lumineers, but was done with a different brand of ultra-thin porcelain. This is truly a lovely result. I honestly must say that I have never seen a beautiful result with Lumineers. But I have seen gorgeous work with other ultra-thin porcelains, some, like the above case, using a no-preparation technique. 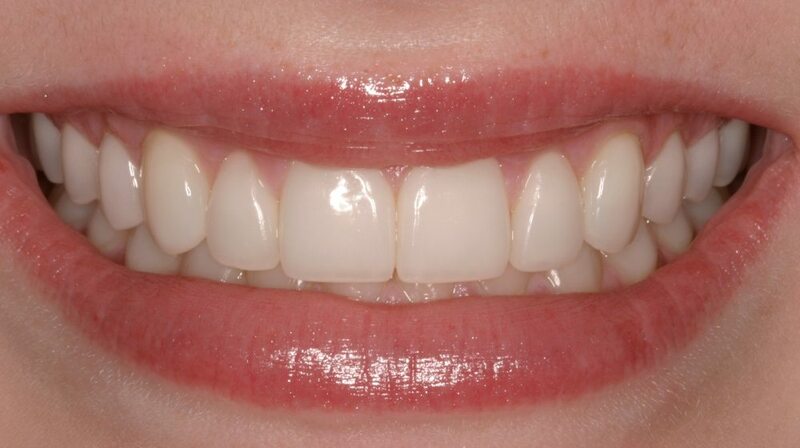 Also, check the other photographs of other porcelain veneers cases on our porcelain veneer pictures page. 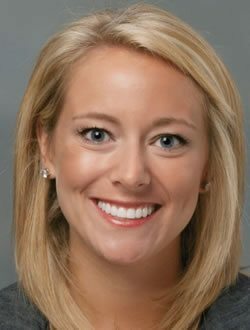 Another easy, economical option for a new smile is the Snap-on Smile, which is a temporary new smile.